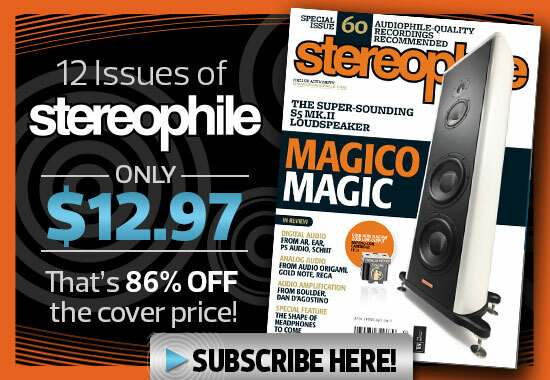 Over the years, Stereophile has created the largest body of credible audio information available anywhere. Each month we add more articles and reviews from the magazine to this online database, including information about setting up audio systems, understanding the science of audio, and how we test and listen to equipment and ultimately music. Generally, products under $1,000 or otherwise seen as a great value by the editors. The opposite of budget components. These are the products that raise even our eyebrows. The audio system's grunt workers, offering full range sound at all price levels. By sacrificing size and low bass, minimonitors can maximize midrange purity and soundstaging at an often affordable price. Digging deep into the lower frequencies, subwoofers help even large loudspeakers achieve true wide-range performance. The preamp controls source selection and volume and feeds the power amplifier. Controls source selection and volume, and does it with vacuum tubes. Provides the heavy electronic lifting to drive the loudspeakers to lifelike sound levels. And does it with vacuum tubes. The all-in-one amplification solution, with a receiver adding an FM section to an integrated. Transforms the low-level output of an LP turntable into a high-level signal to feed a receiver or preamplifier. Get all there is to get from the Compact Disc. SACD and DVD-Audio players offer superior sound quality to CD. Outboard processors can minimize jitter and maximize sound quality, from any digital format. High-performance sound cards and Wi-Fi network accessories turn your PC into a true high-fidelity source component. From 500 megabyte portables to 1 terabyte monsters, this is where you can find out how to play WAVs, AIFs, AACs, & MP3s. Spinning LPs is no trivial task. The turntable also must provide a stable platform for the tonearm and cartidge, while isolating the LP from airborne vibrations and footfalls. The tonearm carries the cartridge across the LP's grooves without adding coloration or distortion, not as easy at it sounds. The sharp end of an LP playback system, the cartridge transduces the groove vibrations into an electrical signal. Pulling in high-fidelity sound from the aether, the FM tuner is an often-overlooked analog source. Without speaker cables and interconnects, your system will be very quiet. LP cleaners, brushes, unguents, & lotions. House current can be notoriously dirty. Treat your system by cleaning up your AC. The room is the forgotten component. Optimizing your listening room's acoustics can give you the biggest sonic bang for your buck. Don't put your new CD player on a credenzeor the floor! Your personal listening center: cans, bags, & amps. Everything else. And we mean everything. 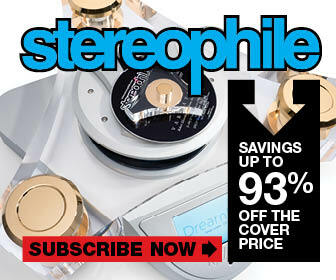 Every issue of Stereophile features a recording chosen for both its sound quality and its musical values. Stereophile's annual listing features the CDs and LPs without which the magazine's writers would pine and with which readers can put together an audiophile record collection without equal. From Elvis to Elgar's Enigma, Cantus to Coltrane and Cooder, without music audiophiles' systems would be amazingly quiet.